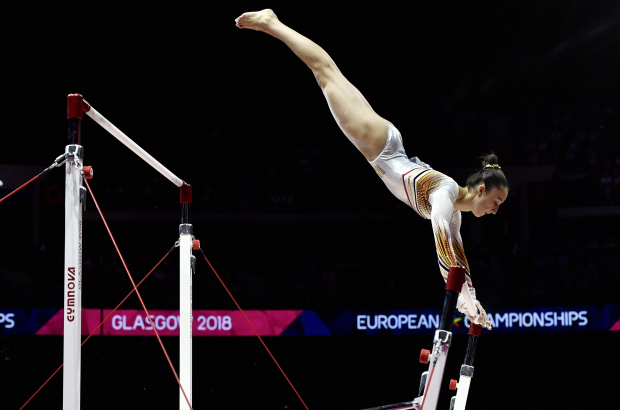 Flemish gymnast Nina Derwael took to the podium twice this weekend at the artistic gymnastics European Championship in Glasgow. She won gold in the uneven bars and silver in balance beam. With Axelle Klinckaert’s bronze medal in floor exercise, the Belgian women’s team ultimately won three medals, tying with France and Russia for the most medals won at the event. Derwael, from Sint-Truiden, made history twice last year when she became the first Belgian to win gold at the European Championships and the first Belgian woman to medal at the World Championships. It was also the first medal won by any Belgian at the world level in more than 100 years. The 18-year-old gymnast scored 14.7 for the uneven bars, with Sweden’s Jonna Adlerteg earning silver at 14.5. She then went on to win silver in the beam, with 13.6, behind Dutch gymnast Sanne Wevers’ 13.9. The men’s gymnastics competition takes place next weekend. Belgium has five competitors on the men’s team. The summer sports European Championships also includes athletics, cycling, swimming and other events. Jolien D’Hoore won bronze in the 10k scratch track cycling event last Friday, while Kenny De Ketele won silver in the 40k points race.